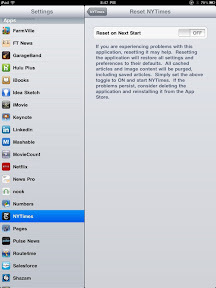 For a lot of people it might be voting, but I have to write again about the NY Times app on the iPad. I get every morning frustrated, but I am still using it. Here is the problem, on one hand the articles in the app are great, I just love the collections of articles and it serves all my needs, on the other hand it is one of the poorest coded app I have seen which cost money. The layout is great and the combination of having videos and slide shows within articles are great. Even that you can tap on an image and it super sizes. But here ends everything. 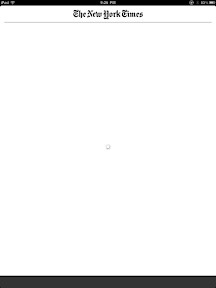 Most of the time when I start up the application I get a white screen. It does not help help to stop the app through the dock or to restart the iPad. Many times I have to delete the app totally and then reinstall it again. This means I have to put my username and password in to get full access (the user name I used to buy the content). Others I can just read 5 articles if I don't input my credentials. 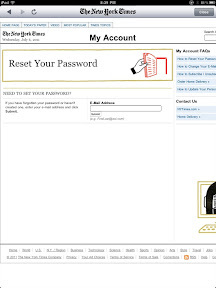 Lucky wise I stored it in my 1password app, otherwise I would be screwed. The forgot password request does barley work. I requested 10 times my password till I finally got it. Even if I don't delete the app I have sometimes to put my credentials in. I figured that if I have less than a 1 GB free, the app does not start. Or if I leave the app on an article level instead of a section overview and come back to open the app (and the article is not available anymore in the NYTimes app) then the app crashes as well. There are many articles which are talking about video clips or images which are not shown in the app. I have to send the URL to my email to see on the website the video or image. Is there nobody verifying such things? The crashes are so bad and often that NYTimes did build a reset button into settings. And it seems to reduce my crashes by 25%. The app is far away from stable and therefore we get all the times updates. I think it is my number one app in terms of updates. 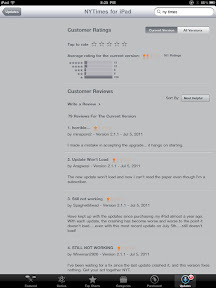 How bad the user experience of the app is, is easily seen on the app store. Only 2 stars for this app. I love the quality of the news but the product manager (excuse my hard words) needs to be fired. This is not a free app and we all can expect it works or we get our money back. It is like buying the paper issue and inside it is just black, would we not get our money back? I contacted several times NYTimes with my issues, I even did write a letter to the editor, I never got feedback. My letter got never published. 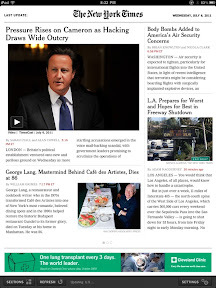 Today will be my last day using the NYTimes app (wishful thinking) and I start to read only Reuters. It is free and never crashes.